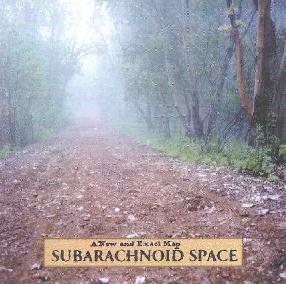 SubArachnoid Space - "A New And Exact Map"
SubArachnoid Space has two new CD's out this year, both on different labels. The one I don't have yet is These Things Take Time, though the track available at the band's Mp3.com site indicates it's similar to their other live recordings. Of their 7 releases to date, only Endless Renovation and A New And Exact Map have been proper studio recorded works, the rest being live performances and rehearsal recordings. On the new album the band incorporates more synthesizers than we've heard yet from them, and in fact each member is credited with playing synths. On A New And Exact Map the band is Andey Stephens on bass, vox organ, and synthesizer, Chris Van Huffle on drums, percussion, synthesizer, samples, and slide guitar, Mason Jones on guitar, sound effects, synthesizer, and percussion, and Melynda Jackson on guitar, synthesizer, and percussion. And as an added treat Doug Ferguson (Ohm, Yeti) guests on one track playing vox organ. There are five tracks on the album, two of them being extended space excursions. "Indy Maru" is my favorite track and the one with Ferguson joining on vox organ. The 15 minute tune opens with eerie organ, various bells and blocks, and subtle but effective sounds and atmospherics from the guitars. The mood is dark but there's also a bit of a Middle Eastern psych feel. Organ fits SubArachnoid Space's music well and is an outstanding instrument in general for psychedelia. As the music slowly evolves the guitars begin their whale song wailing. Proper studio recordings from this band come across as a potent force with each musician and each sound commanding its own place in the sonic whole. Some of the guitar parts reminded me of Djam Karet. And this track also reminded me of Spacious Mind's "The Mind Of A Brother" album for the high powered and totally spaced out combination of guitars and keyboards. Some of the guitars are really searing. It's amazing how much cosmic intensity can be wrung from just a few notes. The other long track is the 18 minute "Melted", which is similar to "Indy Maru" but without the organ. Just a cool extended guitar dominated psychedelic journey through the cosmos that is just as soothing as it is brain blistering. "Prism" and "Fruity Drinks With Little Umbrellas" are a bit different having more rock structure and rhythm than typically heard from SubArachnoid Space. Andy Stephens' bass is partly responsible as it helps set a steady and confident pace. The guitars are still the heart of the band's music but the more prominent keyboards and synths really flesh out the music and send it in more varied and exciting directions. "Fruity Drinks With Little Umbrellas" is totally unlike anything I've heard from SubArachnoid Space yet. It starts as a spacey rockin' Dub tune, but quickly launches into an Ozric Tentacles styled jam. A heavy driving spacerocker! Finally, "Drink Me" is the one live performance on the album, taken from a show in Las Vegas and is classic SubArachnoid Space. Very trance trippy and embellished by space synths. In summary, A New And Exact Map is an impressive step forward for SubArachnoid Space and as the year winds down I can tell this will easily make my top ten for 2000 list. Fans of the band will surely like it and I can see this album broadening their audience as well. I had the opportunity to chat one evening with guitarists Mason Jones and Melynda Jackson. AI: Tell me about how SubArachnoid Space originally came together from the standpoint of the music you were all into or influenced by. Mason: Well it first started as a trio. At the very beginning there was only the one 7" done as just the trio. Mason: ...experimental stuff, as was I to some extent. Melynda: Mine is pretty much a rock 'n roll background. Melynda: ...you and Jason [Stein] wanted to get it together right? Mason: ...yeah, I asked him if he wanted to do a slightly more experimental rock type project instead of the purely experimental stuff I was doing before that. Probably the big inspirations at that time were everything from Japanese band Fushitsusha, to Skullflower, to early Sonic Youth and early Pink Floyd. A lot of new and old things combined. AI: Are you all currently original members? Mason: Melynda and I. The two guitars. AI: With the exception of Endless Renovation and A New And Exact Map, all your CD's [7 total] are live and rehearsal recordings. The two studio CD's really stand out from the rest in terms of more instrumentation. Are these different sides of the band or would you say they're the natural result of live vs. studio SubArachnoid Space? Melynda: They are different from the live recordings, definitely. More forethought involved. Mason: The live stuff by necessity is more stripped down. Obviously, it's just the four of us. So I'd say it's just a matter of taking advantage of opportunities. Melynda: As far as mixing and overdubs especially. Mason: And bringing in friends to join with other instruments and playing more instruments ourselves too. So it's a matter of live you get the spontaneity and the energy and everything that comes with playing live. Studio... you get the other side which is the chance to think things through more and just play around more. AI: I understand live you do mostly improvised music. Would you say the music on the two studio CD's are composed to an extent or do they start out as improvs as well? Melynda: Endless Renovation was strictly improvised in the studio. There was no forethought given to anything we did there. But A New And Exact Map, we thought about a couple of pieces we wanted to do that were loosely structured... or improvised sort of with an idea of what type of structure we wanted the songs to have. Melynda: It's about 50/50 I'd say. Mason: There's a lot more structure within which the improves can happen then there used to be. Mason: Yeah, whatever we have we'll eventually end up using that's for sure. Different synths on different tracks. Whoever was inspired to add something to it. AI: Doug Ferguson plays on a track. Did you hook up with him because you were on tour with Ohm or Yeti? Melynda: He was actually in town for Progfest. He was staying at my house and we just decided to take him down to the studio with us. And that piece that he played on [Indy Maru] actually, the whole thing was just 10:00 in the morning improvised. Mason: I guess I originally got in touch with Doug because of the Vas Deferens Organization connection. Because I put out a VDO release on the label [Charnel], and then we started talking by email and he sent me the Ohm rough mixes. And when he came out here we figured keyboard always works well with us so come in and see what happens. AI: Your web site says you've turned your rehearsal space into a studio. Does this mean we'll be hearing more studio releases like A New And Exact Map, or not necessarily? Melynda: It's pretty amazing. I didn't think that it could sound like that. Mason: Yeah, we've got pretty much an album and a half's worth of stuff with the basic tracks recorded, and we're just going to be working on that for a while. I think it's probably safe to say that we won't be doing another live album for a while. Unless something spectacular happens. You never know. AI: The only track I've heard from These Things Take Time is the one off your web site. This is a live album right? Melynda: Yeah. That was a live radio show at KFJC. Mason: The sound quality's a bit better than most live stuff because it was recorded to ADAT 7-track. But it's still live so it's got that rough feel. AI: Any other projects going on we should know about? Mason: Yeah, Melynda's playing in Property Of Thieves. Melynda: It's an improv, sort of noise thing. But I play guitar in it. And people play things like tone generators and police scanners. And there's some electronic beat work going on with a sort of revolving door membership. Dave Wright from Not Breathing sometimes plays in it. You can find it on Mp3.com, we don't have anything out yet. And if you look at the links on those Mp3.com pages there's several other... one of the other projects is called Earwicker. And there's another called KimoSciotic Communications. All of these involving friends of ours. Revolving door improvisational projects. Some of it's kind of dark. It's sort of electronic but it feels pretty... it's feels like it has biology, not just machines. Mason: It's electronic but not sequenced. Melynda: It's live mixing actually. What happens is the musicians play and they're mixed live out to tape or through a PA if it's live. Melynda: Not as much as you'd think. There really aren't that many venues to play anymore if you're not pretty well known. SubArachnoid Space has no trouble playing about once a month on average. But the other projects we try to get them on bills with SubArachnoid Space. AI: Any other future news you'd like to pass on? Mason: We'll hopefully be getting out East sometime soon. It depends on what's going on next year. We might go to Europe. We might go to the East coast. A New And Exact Map is distributed by September Gurls. You can email them at septembergurls@compuserve.com. Contact via snail mail at September Gurls; Sigmundstr. 92; 90131 N�rnberg; Germany. Check out the sound files at their Mp3.com site. The are lots of tracks from the Property Of Thieves project Melynda spoke about at their Mp3.com site. As she indicated, there are several links to other experimental bands that are worth checking out.